The Paramedic side missions can be activated while in an ambulance. 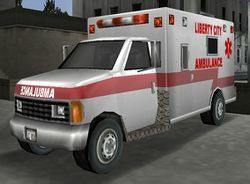 Side Missions (also known as sub-missions or odd jobs), are optional non-storyline missions available in many games throughout the Grand Theft Auto series. These missions are usually not part of the storyline and can be started at any time while not on another mission. Many side missions involve performing errands or jobs in particular vehicles, whilst others are races and sports. Side missions can be started in many ways: by pressing the side mission button in certain vehicles, entering specific parked vehicles, or standing on a mission marker. Most side missions are required for 100% completion of their respective games. This page lists all side missions, and the vehicle they involve (if relevant). To trigger a vehicle mission in the GTA III Era, the player must use the corresponding controls while inside the appropriate vehicle. The missions give the player a time limit to complete the set of objectives in that level, which is calculated with respect to distance. Cash is rewarded for completion within time. If the player runs out of time, or leaves the vehicle for too long, the mission fails and the player must start from level 1 (for certain GTAs). The Vigilante side missions can be activated while in a police car. The Taxi Driver side missions can be activated while in a taxi. This page was last modified on 21 December 2013, at 18:44.